My twin (fraternal) nieces live in California and I live in Colorado, so sadly I do not see them much. But the internet helps. I like to make them something for Christmas and usually make an ornament. I was thinking their tree might be getting full, so I made each of them key chains. They are 23 so ideas for gifts to make can be tricky. For one niece I used the chart from the November 2011 Issue of cross-stitch & Needlework Magazine. I stitched in on some green aida I had on hand and changed some of the colors to one's she likes - lime green and pink. It is folded on itself and therefore the same on both sides. 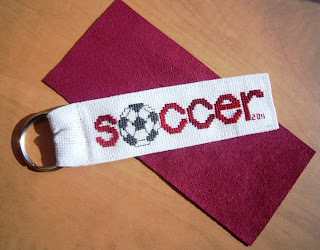 For my other niece I made a key chain showing her favorite sport - soccer. The chart is from the book by Sam Hawkins called 501 Cross Stitch Designs. Published in 1993 by Meredith Press for the American School of Needlework. For this one I did not fold it on itself, I sewed ultrasuede on the back (shown here under the stitched piece). They were fun to make and I am told they liked their gifts. It's terribly windy up our way, I dislike it so much. I can't wait for our three day weekend, a new year, and lots of new possibilities!